Safety equipment is a wise investment for businesses to create a safe working environment for staff and visitors to their site. We offer a wide selection of products to make this easier. These include safety barriers, which can be used to protect both your assets and workforce. To find out more check out our barrier guide. Barriers can be very effective in car parks, but many options are equally suited to indoor locations. With an extensive range available at Seton, you are sure to find a safety barrier to suit your requirements. 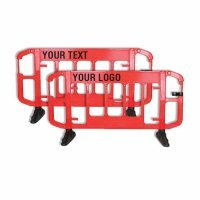 Our safety barriers come in a range of options including steel or polyethylene to suit the varying needs of your business. Designed to be durable for long-lasting protection, our selection includes safety barriers ideal for both indoor and outdoor use. Many of our barriers are portable to allow them to be moved as required. We also have fixed barriers ideal for increasing security at company entrances or marking the boundaries of car parks. There are several options for protecting pedestrians, including our selection of crowd control barriers. For creating a barrier around a short-term hazard, temporary fencing is a cost-effective way of managing safety. Barriers are an effective security measure which can significantly reduce the chance of accidents in the workplace. 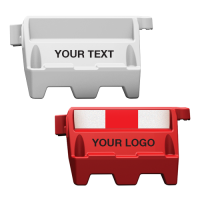 For increased safety, use barriers in conjunction with other items in our range. Floor marking tapes can be used to highlight hazards such as steps in dim light and traffic and car park signs will guide vehicles around your premises. The wide range of safety barriers available from Seton will allow the safe management of people and vehicles in a variety of situations. In areas with a lot of traffic such as carparks, construction sites, and retail locations, the risk of accidents can be high. The effective use of safety barriers can do a great deal to reduce the likelihood of dangerous occurrences. The safe management of vehicles moving around, arriving, or departing your premises will increase both the safety and the efficiency of any site. For both staff and visitors, the presence of security barriers provides reassurance that their safety has been considered. Good vehicle management is essential to the smooth running of any site, but with the use of safety barriers and other traffic management products from Seton, it is not difficult to implement. At Seton, we take pride in fulfilling our motto of ‘safety made easy’. We make sure our barriers meet the required safety standards in UK and EU legislation, giving you complete peace of mind when you shop. If you are unsure which of our safety barriers is best for your circumstances, please get in touch for advice and assistance.